Motorola may follow HTC’s lead in the processor game going into 2012 according to a new benchmark for a device headed to AT&T. 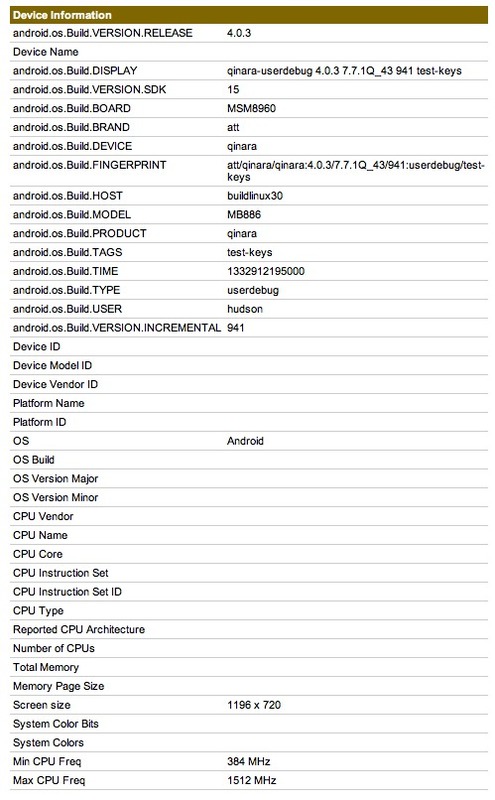 The MB886 (formerly rumored by us to be the Dinara) aka the “Qinara” or possibly even Atrix 3 posed for GLBenchmark this morning, giving us a look at specs for Moto’s next big device. As you can see from the top, it’s running Android 4.0.3 just like every other new device these days. What’s interesting though, is the chipset used is Qualcomm’s MSM8960 or better known to most as the dual-core Snapdragon S4 clocked at 1.5GHz. This is the same chipset used in the HTC One XL that could arrive on AT&T in the next week, but is surprising because this is Motorola using it. In the past, Moto has stayed close with TI and their OMAP series and even cozied up with NVIDIA for a device or two. This would be a first for them and Qualcomm, to our knowledge. So why the Snapdragon S4? 4G LTE, baby. Phones in the U.S. on AT&T and Verizon in 2012 will likely only be 4G LTE, so since the current Tegra 3 isn’t playing nice with it, OEMs are going with Qualcomm’s S4 which does. On a related note, we were discussing the DROID RAZR HD this weekend with our buddy Taylor over at Android and Me, and he is under the impression that it will also rock a Snapdragon S4 for the LTE capabilities it possesses. This benchmark would certainly help that theory. Lastly, the screen resolution reads 1196×720, so we know this phone will have an HD screen. Since it doesn’t read 1280×720, this could mean that the device either has on-screen keys like the Galaxy Nexus, or it could mean that the GLBenchmark app isn’t ready for ICS and is using that awful menu button at the bottom of the screen which is taking up screen space. Excited for Moto and Qualcomm to be in bed for a bit? The S4 Krait series of chips is supposed to be remarkably good.